Yearly Inspection. A yearly inspection is a good idea. Do this at a quiet time of year gardening-wise. Check the sharpness of all tools, check the handles, and do any appropriate maintenance. Handle Replacement. Remember, you can replace the handles on most tools.Think about repair before replacement. Label Your Tools. Think about marking your tools with your name, especially if you loan tools, or work in a common area. Use a bright color so you’ll see them lying in the grass when you quit for the day! Hats and Gloves too! Don’t forget the most important “tools” you bring with yourself;; remember to use a good hat, some sunscreen, sturdy shoes, and a pair of gloves! Clean your tools after using them; shovels, forks, hoes, pruners, saws, everything. Doing it manually (with gloves) usually works, but you can use a bristle brush, a garden hose, a putty knife; whatever works. View our video on How to Clean and Sharpen Pruning Tools. Don’t store your tools when they’re wet! Always let them dry. Use the sun, a towel or rag. For rusted metal: remove the rust with a wire brush before coating with oil. If the rust is heavy, soaking it in white vinegar can help as a start, use steel wool, the finer the grade the better. Remember that fertilizer or other chemicals are especially corrosive, making it more important to clean. Cover steel surfaces with a light coat of oil before putting tools away. An ideal way to do this is to use a rag soaked with motor oil. A tip: fill a five gallon bucket with sand, pour in some used motor oil, and then dip your tools in it after using them. The sand will wipe off small particles of dirt, and the tool will get a coating of oil at the same time. For wood handles, clean them, then check for splinters or cracks. Splinters can be sanded down, cracks call for a replacement handle. Occasionally coat the handle with linseed oil, applying several coats until the wood no longer absorbs the oil. You’ll be left with a shiny surface more resistant to dents. For fiberglass or plastic: clean them with a rag and check for damage. Trickier because of the moving parts, remove all dirt and moisture. A tip: use a bathroom foaming cleanser and wipe with a rag, then use household oil or a greaseless lubricant for the pivot point. While not as good, WD-40 is all right if that’s all you have, but it leaves a sticky residue that attracts dirt. Keep your tool blades sharp to reduce stress on the tool—and you! Remember, a badly sharpened tool will work better than a dull one. If you aren’t comfortable doing your own sharpening, if your tools are very dull, or nicked, or if the tool is very expensive... it may be better to have a professional do it. Pruners may need to be disassembled first. Use any commercial tool to sharpen blades: carbide, stone, or ceramic. A pocket sharpener is easiest for small tools, a bench stone or grinder may be useful for larger ones. Only sharpen the beveled edge, maintain the original bevel angle as much as possible. Don’t thin the blade so much that you risk bending the blade when you cut. A tip: use a marker to color the bevel and then sharpen until all the color is evenly removed. It isn’t necessary to keep the blade of a shovel sharp, just remove any metal that folds back on itself. Using a flat edged file will work most of the time, or a coarse sharpening stone. It’s handy to have a vise to hold the tool as you file. 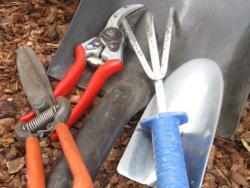 The Center for Landscape and Urban Horticulture has an online publication on Pruning that recommends "If diseased plants are pruned, disinfect pruning equipment after each cut to prevent spreading disease. Denatured alcohol or a chlorine bleach solution can be used to do this."